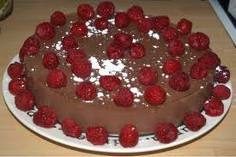 An easy refrigerator chocolate mud pie covered with fresh raspberries. Melt the butter in a pan. Add the sugar and cocoa powder, mix with a wooden spoon. Turn off the heat and pour the mixture into a bowl and add in the fruit and biscuits. Cover a baking tray with foil and apply butter. Spoon in the mixture. Put in the fridge for 3 hours. Carefully, lift the foil out of the baking tray. Top the mud pie with your melted chocolate and berries and enjoy! I came across this recipe for kids. My children had a blast helping me bake the chocolate mud pie. They enjoyed licking the chocolate recipe mix out of the bowl.